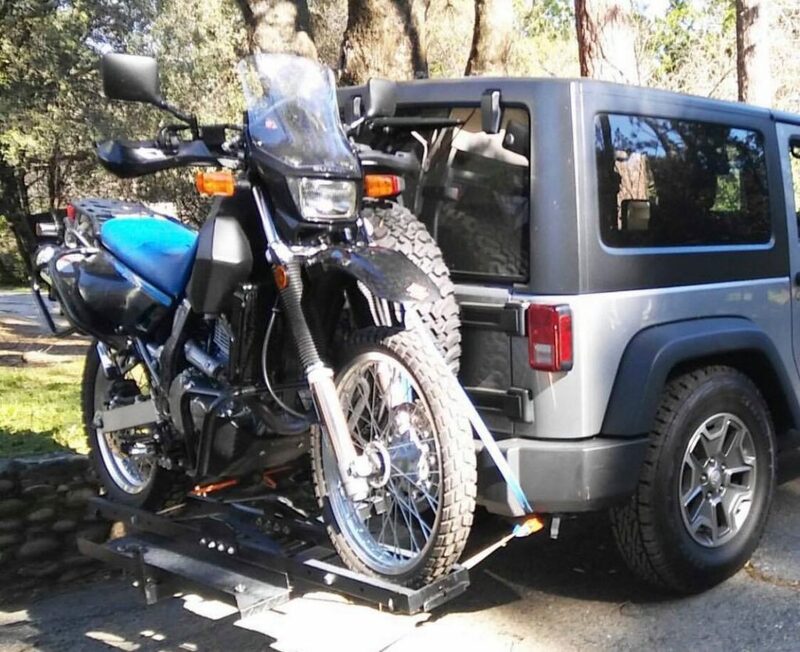 Using a motorcycle hitch carrier will allow you to easily transport motorcycles of all sizes. It may not always be possible to ride your motorcycle as the destination may be too far away or it may have mechanical issues, which makes a carrier very useful. The best motorcycle hitch carrier is the Goplus Carrier, which has a weight capacity of 600 LBS and uses a heavy duty powder coated steel construction. The motorcycle carrier will connect directly onto the trailer hitch but the limitations will depend on the construction of the carrier. You will not want to exceed the weight limit stated by the manufacturer and you may want to haul multiple motorcycles. Considering that the carrier will be transporting your pride and joy, it is vital that the build quality is to the highest of standards. Just as important is the ability to load the motorcycle onto the carrier because this will defeat the purpose of the carrier. Using a hitch mount motorcycle carrier is a much quicker and easier solution than using a trailer. You can even purchase carriers that come with anti-tilt functionality, which increases stability when out on the road. Below is a list of the best motorcycle hitch carriers that are of superior quality and suitable for a range of weight capacities. The Goplus Motorcycle Carrier is one of the most popular motorcycle carriers available. It has been designed to transport sports, enduro and off road bikes behind your vehicle and supports up to 600 LBS in weight. Overall, the Goplus is the best motorcycle hitch carrier for the money with a high weight capacity and superior build quality. In terms of the drawbacks, it will require assembly when it arrives and the manufacturer states that you should only travel at a max speed of 45 MPH. However, whether you stick to the specified speed is completely up to you because it will keep the motorcycle completely steady. For those that might want to spend a little bit extra, the Black Widow motorcycle carrier is a great alternative. As with the Goplus carrier, the Black Widow is able to carrier up to 600 LBS, which makes it suitable for a range of motorcycles. The Black Widow MCC-600 is a heavy duty motorcycle carrier that does come with an expensive price tag but is totally worth the investment. The solid steel construction is capable of holding a range of motorcycles and is relatively easy to assemble. One of the most premium examples is the VersaHaul motorcycle carrier, which has a carrying capacity of 600 LBS. It is also capable of holding two motorcycles, which may be a key factor for many people. Overall, the VersaHaul is an excellent piece of kit but it does come at an expensive price. However, if you require a double motorcycle hitch carrier, it is the best option. It is also worth noting that although the total weight capacity is 600 LBS, each rail is only rated to a maximum of 500 LBS. The TMS motorcycle carrier is suitable for a range of different types of motorcycles and will fit onto standard 2 inch square class III, IV or V receivers. In terms of loading motorcycles onto the carrier, it is dual sided to make it far easier. The TMS motorcycle hitch carrier offers everything you would need at an affordable price. The carrier will work well for the majority of all motorcycles that do not exceed 500 LBS. One of the most affordable motorcycle carriers is by Best Choice Products. It will fit most vehicles that use a 2 inch square receiver for use with a Class II, III, IV or V hitch receiver. It has a weight capacity of 500 LBS and is ideal for motorcross bikes, scooters and off road bikes. Overall, the Best Choice Products is an excellent all-round motorcycle carrier that is one of the cheapest available. It is made in China but it still as high quality as the alternatives within this article. Transporting your motorcycle can be a difficult task. It may be tempting to load it onto a hitch cargo carrier but it wouldn’t be as stable as one specifically designed for motorcycles. Features such as anti-tilt devices, tie down sites and adjustable wheel chocks are just some of the features that make a motorcycle hitch carrier much easier to transport your motorcycle. To help you make an informed buying decision, we have produced the below buying guide regarding motorcycle hitch carriers. Every motorcycle hitch carrier will have a weight capacity limit, which you should not exceed. The majority will range between 400 and 600 LBS but there are some expensive custom setups that will able to handle even more weight. Steel constructions are often heavier but they are able to handle far more weight. There are aluminum alternatives that are lighter, which is great for setting up the carrier but they mostly only have a weight capacity of approximately 400 LBS. The manufacturer of the carriers will state the hitch class that is compatible with the motorcycle carrier. For safety reasons, you will want to stay within the suggested guidelines to avoid any issues. Most are also designed to work with most standard 2 inch receivers, therefore if your vehicle uses a different size hitch, the carrier may not be compatible. Not every motorcycle carrier will be the same size and there are benefits of both small and large carriers. For example, longer ramps will mean you will have less of slope to push the motorcycle up, which makes loading far easier. However, you cannot exactly install a 100 inch carrier to a vehicle that is only 60 inches wide. Therefore the shorter carriers are less obtrusive and will be easier to install. The width may not be an issue for many motorcycles but those that use wide tires may need to ensure they take measurements beforehand. Connect the support brackets to the trailer hitch bar. Put the carrier between the two brackets. Some manufacturers may have a different setup but most will be similar. We highly recommend that you follow the supplied instructions and ensure that all the mounting hardware is installed for maximum stability. The motorcycle hitch carrier will need to be able to withstand the harsh weather conditions and heavy duty usage. As mentioned above, the majority are constructed of strong steel or aluminum. Both are heavy duty and are resistant to corrosion and they will also be powder coated for further resistance. Some of the more premium carriers are available with a range of extra features that can improve the usability. One such desirable feature is the inclusion of a ramp, which makes loading your heavy motorcycle onto the ramp much easier. To improve stability, most carriers are available with an anti-tilt device and multiple tie down sites. This ensures that the motorcycle does not move around whilst driving, which can potentially cause the motorcycle to fall off if it moves around too much. It can also make the drive within the vehicle less comfortable. Transporting your motorcycle using a carrier can make things far easier and safer. You can attempt to transport it via your truck bed or inside your vehicle (if possible) but you are very likely to cause damage and have less room for other cargo. All of our recommendations are suitable for a range of budgets and are capable of transporting a range of motorcycles. 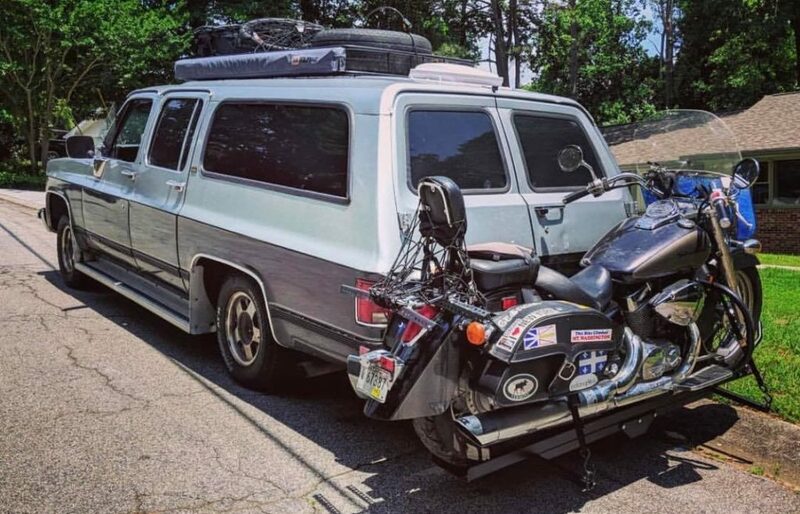 There are many cheap carriers available but considering most motorcycles cost thousands, you will want to make sure that it uses the best motorcycle hitch carrier possible. This will ensure that the motorcycle will remain stable and the carrier can handle heavy usage. When choosing your carrier, ensure that the motorcycle does not exceed the weight capacity and that it comes with a range of features that keep it completely stable.